Future Shop and Best Buy have dropped the price of the 32GB iPhone 5s to $279.99 on a two-year term, which is $50 off the regular price of $329.99, available from Telus, Rogers, Fido, Bell and Virgin Mobile. The price is available in-store and not available online. 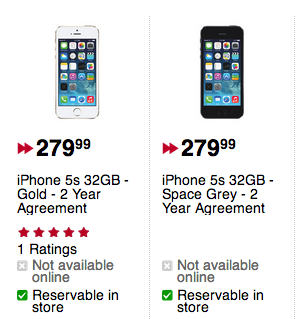 The discount is decent, but during Black Friday last November the 32GB iPhone 5s was down to $199 on a two-year term. Let us know if you’re going to jump on this!